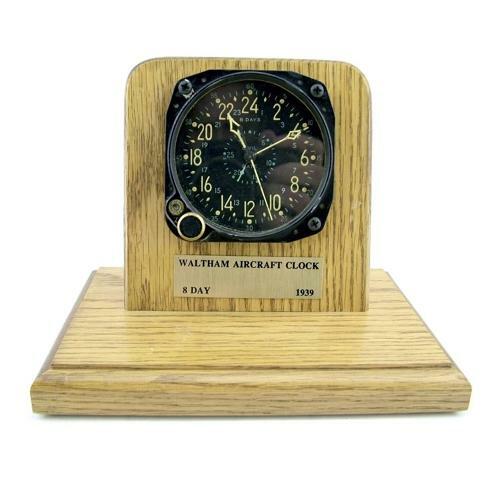 By Waltham Watch Co. Metal cased cockpit clock, approximately 8cm diameter. Black dial with luminous 24 hour Arabic numerals and hands. Smaller inner 'date dial' and indicator hand - all functioning correctly. 15 jewel 8-day lever movement with centre sweep seconds hand. The date hand advances each day or can be set manually by pressing a small inset button above the main winding knob. Dial is marked '8 Days, Civil Date, B.U Aero, U.S. Navy, Waltham'. Shows light use and wear but is in very good working condition and has been mounted within a handmade solid oak desk stand. An impressive time-piece. Stock code C22924.